Suspense thriller is a genre which rings quite a bell as soon as a reader settles down to read one. It never fails to strike the hidden agenda or purpose of either parties and keeps the readers busy and all the more interested. Stephen King in his book "Mr. Mercedes" keeps things tight and let the readers be on a prowl for the hunter and the hunted. So has he given it all? Let's find out. In a Midwestern city, a man climbs into a Mercedes-Benz fueled by a dark agenda. He drives to a job fair, where thousands of unemployed hopefuls vie for a chance at a career. They have no idea that a killer is coming towards them. The driver strikes before dawn, and leaves eight dead and fifteen injured in his wake. Just as mysteriously as he appeared, the killer vanishes into the fog, never to be seen again. Or so the retired detective Bill Hodges thinks. Streetwise and battle-hardened, he had worked on the case when it was still fresh, and gave up on it thinking that it led nowhere. However, an unnerving letter arrives at his door and claims to be from the killer. Bill can’t resist the pull of the Mercedes killer, for more lives are at stake. The killer will strike again, and only Bill and his allies stand in his way. First look at the title and the cover and a reader cannot decipher what exactly the title or the cover wants to convey. The tagline of suspense thriller ups the excitement. But all things aside cover is pretty mysterious and dark. The blurb talks about a psychopath and a retired Detective whose paths are set to cross. The blurb pretty much keeps it simple and let the readers take a deep plunge into the land of Mr. Mercedes. The story is about a certain Mr. Mercedes who due to his nefarious and notorious actions kills 8 innocent people in a job fair. On the other hand Bill Hodges has retired now but he rues the fact Mr. Mercedes managed to give him a slip while he was fit and active. But Mr. Mercedes in on a prowl again and this time it's going to be huge. So will it set the tone for another action packed chain of events? Who will strike first, Mr. Mercedes or Detective Bill Hodges? Will Hodges ever be able to uncover the sinister motives of the Mercedes man? Who will lose all or who will gain from the tussle between a psycho mind and an old, yet agile brain? That's what the story is all about. The name doesn't rings a bill. Sound like a car but it looks more devious from inside than the outside. 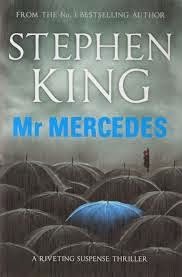 Mr. Mercedes even the name sends shivers down the spine and the way he functions in the entire book, is enough to spark a calamity in a calm mind. The cat and mouse game between Hodges & Mr. Mercedes is the glowing aspect of the story. One ahead of the other all the time. The moralizing factor that it continues to tumble out old skeletons out of the closet and puts the future at stake becomes more exploding and riveting. The suspense element is there and as it turns out a different kind of a finish to the story sets it apart from other thrillers in the genre. The book loses out on the suspense element pretty much. There's not much suspense and it is predictable but the motives are always under a shady eye so that keeps a little but of suspense element going. More of darker twists and turns could have justified the tagline of the book. It fails to capitalize on some crucial elements of the story and rather delves into personal spaces. All in all the story is not half bad but it's not great either. The book has all the meat to be a thriller but not enough to tag it as a suspense thriller. The wild goose chase is certainly an uncertainty and let readers stay off course for most of the length of the book but on the other hand the delusions seem simple and don't catch the mind off guard or spin a rather vivacious account about the gore or the murder or the murderer. It's a mixed bag of tricks and with it readers get to see some unrealistic yet notable fiction characters in the end. A curious story.